INDUSTRY.co.id - Jakarta - Recently Bank OCBC NISP was awarded again from The Asian Banker Indonesia Country Award Program 2017. This award was received directly by Thomas Low - Director of Bank OCBC NISP in Jakarta. "The awards consist of SME Bank of the Year and Best Corporate Payment Project. 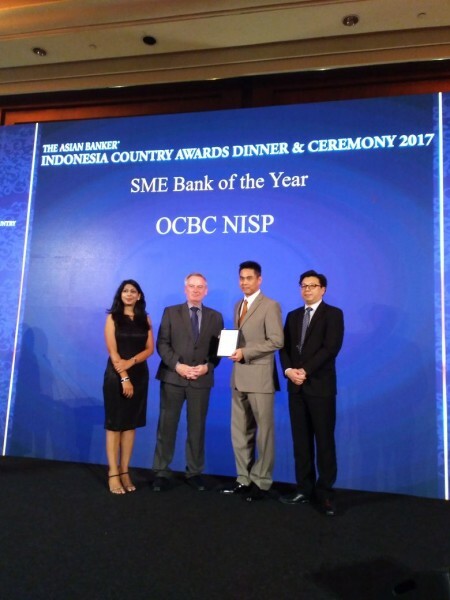 For the category of SME Bank of the Year, Bank OCBC NISP is considered successful in consistently posting good performance in funding and lending indicators," said Thomas Low - Director of Bank OCBC NISP in Jakarta, Thursday (10/08/2017). In addition, Bank OCBC NISP, he continued, uses a qualified data analysis to explore customer needs in accordance with the risk profile. The Best Corporate Finance Project is an award received by Bank OCBC NISP for corporate payment platform through Velocity 2.0. Previously, Bank OCBC at the end of first semester of 2017 net profit grew by 24 percent (yoy) to Rp1, 1 trillion from Rp 914 billion in the same period the previous year. The increase in profit was mainly driven by a net interest income increase of 11 percent to Rp2.9 trillion in June 2017 from Rp2.6 trillion in June 2016.